This is Melissa with Moe Creations, guess what time it is???? 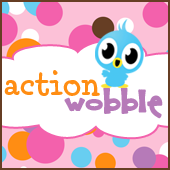 If you guessed my day here at the Action Wobble blog then your absolutely right! Check out little Pooky, isn't he adorable, I just love him!